An outdoor gazebo will certainly give you an additional garden space that could be used for relaxing, dining or partying. 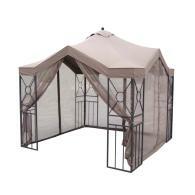 If you're looking for outdoor gazebos, then Lowes carries a nice selection of different structures. Some of these gazebos are made in aluminum, whereas others are made in wood. Some are more permanent structures, whereas others are easier to move. If you're looking for something for a party or other event, then you could very well make do with a temporary structure, however if you're looking to add an extra outdoor room in your garden to enjoy during summer, fall and spring, then a permanent gazebo is really the only way to go. "Black powder-coated finish for durability. Water-repellent canopy. Easy to assemble, tools required"
"Rust-free aluminum frame. Wood-grain coated finish for durability. 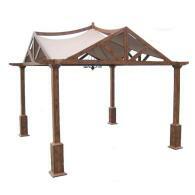 Water-repellent canopy"
"This Gazebo Is Panelized And Has A Two Tier Roof. Outdoor Screen Kits Are Available. Made From 100% Western Red Cedar. Gazebos Come With Cedar Deck And Shingled Roof. All Assembly Hardware Included- Even The Drill Bit." "Everything is pre-cut, nothing to saw. Easy to assemble with common household tools. Panelized construction for easy assembly. Crafted from select tight-knot western cedar. Includes decorative metal cap with two wooden finials. Decorative spindle styling. Shingle to suit your decorative taste"
Name: LS | Comment: The Garden Treasures Living 10'x10' Aluminum Deluxe Gazebo with Chandelier as shown above, is actually called a Pergola. The package contents sheet that was included with the Pergola has replacement parts. The model number is #GF-8A117B. The Customer Service Dept # 800-444-6742. Name: Mike | Comment: I tried that # as well but they did not have the parts that I was looking for. 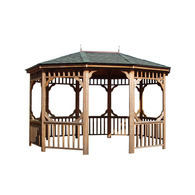 Name: FAYTH | Comment: I JUST PURCHASED THE 'PERGOLA' VERSION OF THE GARDEN TREASURES DELUXE GAZEBO. I HOPE TO BE ABLE TO ANCHOR THE POSTS BY POURING CEMENT AND FIXING A WOODEN POST INTO THE CEMENT TO MOUNT THE ALUMINUM POSTS OF THE PERGOLA OVER. THIS, HOPEFULLY, WOULD STABILIZE THE STRUCTURE ENOUCH TO PREVENT FLIP OVERS AND PROVIDE A CEMENT PAD TO ATTACH THE OUTER FEET TO. I WONDER HOW YOU FOLKS ATTACHED YOUR STRUCTURES TO THE GROUND, OR WERE YOU REFERRING TO THE OTHER GAZEBO? in the picture above, upper left corner. I purchased from Lowes a few years ago...and nobody knows the item # or where I can order one! Please help!! Thank you! Name: Pam Brown | Comment: I am looking for the same one as you Amy. I called lowes they seem to think it was their past model item # 135433 call 1-800-444-6742 for replacement. I haven't been able to get in touch with them yet... let me know if you found out anything, thanks. Name: Pam Brown | Comment: Amy the number I gave you is definitly the right one... I called them and had them fax a picture of it to me. Name: Robyn | Comment: I also have the aluminum gazebo (without chandlier). I purchased the replacement canopy right off the bat so I would have it. But a couple of the supports need to be replaced and they are not available through the 1-800 #. I am wondering if anyone has decided to scrap their gazebo and would be willing to sell me their parts. I need part C, which is the cross bar. It is a long L-shaped piece. You should have 8 of them. I need at least 1, but would take as many as you have, since this seems to be a weak spot in the design. Thanks for your help. Name: LAURIE | Comment: FOLLOW UP- AFTER TO TALKING TO PAT AT OUR LOCAL STORE- HE FIRST TRIED TO TELL ME TO TURN IT IN TO MY HOME OWNERS! I LAUGHED IN DISBELIEF, GAVE HIM ALL THE INFORMATION I KNEW- THEN STATED, SO YOU ARE TELLING ME TO TURN IT IN TO MY HOME OWNER'S...AFTER MUCH PERSUATION AND DISSATISFATION- I WAS TOLD - WITH MUCH HESITATION...I COULD BRING IT BACK TO THE STORE FOR A REPLACEMENT. GOT HIS NAME AND ONE ON ORDER! Name: Kristin | Comment: We just purchased the 10X10 Garden Treasures Living pergola last week and it did not come with any support bars (H) and it should have 8. The phone number listed for the manufacturer's customer service department is 1-800-457-4652. They are operational Monday-Friday only. Since this number was different from the one listed above, I hope this helps some of you trying to find resolutions. I'm curious to know how some of you attached the pergola to the ground? The lawn stakes that came with it are laughable at best - especially here in Florida with our hurricane season just beginning. Name: Steve | Comment: I bought the 10' x 10' pergola this weekend. I used masonry drill bit and a special screw for concrete - I think they were called Tapicon screws - you can get 'em at Lowe's. It's anchored in good. PROBLEM IS - first gust of wind came along and it lifted the fabric off like a kite. I was ticked. Now trying to find a better way to anchor the fabric. Ended up weaving over and under teh support beams for now. Anybody have a good idea? Name: Roger | Comment: I just purchased the 10x10 Garden Treasure pergola which was the floor model in good shape, problem is it didn't come with an assembly manual. It doesn't look to difficult, can any one provide a copy of their? For those looking to secure the fabric I was thinkin I would buy self tapping screws and use those on top of the support bars along with a washer to prevent it from flying away. Has anyone tried this? Name: Bill | Comment: I lost the assembly instructions any help from anyone would be of great help. Called and got bumpkiss said they only include one set of instructions and was recommended to return to the point of purchase. Name: Marion | Comment: I called 1-800-643-0067 and they were able to get me a replacement canopy and netting for item #135433. This number was given to me by a Lowe's employee off of the box of another Garden Treasures product. The price was much less than I had found on another website. I got both products for 95.00 including shipping. I hope this will help. Name: stewart | Comment: Hi, I purchased the display gazebo item #126382 12x10 at lowes. No instructions. staff at Lowes told me to just type the name Garden Treasures into google will lead me right to manufacture then type mod #126382. Of course a load of rubbish. Lowes have no others and really quite unhelpful. Anybody out there know how I can get assembly instructions for this "Treasure"? Name: Nancy M | Comment: We also just purchased the 10 x 10 gazebo (the one pictured on the top right of this page) and it was a return at the Lowe's we purchased it from. The instructions were not included so if you have or have received the assembly instructions, I would be forever grateful. My e-mail address is nmmowry@sbcglobal.net and many thanks!! Name: David | Comment: If anybody know where I can buy or should I say, where I can find one in stock of the Garden Treasures Living 10'x10' Aluminum Deluxe Gazebo with Chandelier (top right picture) please let me know. I live in Georgia and even willing to pay a little extra plus shipping cost. If anyone can help me out, please email me at davidthao@hotmail.com. Thanks. Name: Paul and Danielle | Comment: My wife and I throwing item #135433 away, due to several bars breaking, and not being able to get replacements. . The rest of the pieces are in OK shape. If anybody wants any of the other pieces, please e-mail us at dwagner745@aol.com. Please put Item #135433 GAZEBO IN SUBJECT, so that we know i9t is not spam. Name: RB | Comment: last year purchased the pergola from lowes (the one on the top right--pagoda style). Left it up all winter thru wind and rain.. no problems except for the whole thing moving around my patio abit.. this year was going to use 4x4 inserts and cement posts to the ground.. too late. One freak wind shear and it toppeled over, bending the corners of one, busting another. Canopy was fine--I surprise I know--. So now, am trying to find the parent company to order couple new cross supports. Good luck. Lowes has no idea, one site listed NuMark as the parent company in China (no luck there). Apparently, unless its anything other than the canopy, you are out of luck. If anyone has managed to locate this elusive company and can actually get parts.. let everyone know, otherwise I would suggest NOT buying another one of these products from Lowes as there is no support and no replacement parts. Name: bryan | Comment: I was able to obtain the manuals for both gazebos in pdf just email me if you need them. Name: kent | Comment: Bryan- Please email the pdfs to me: kent@wellsdg.com THANKS!!! Name: Susan | Comment: Like everybody else- bought GF-9A037X at Lews last night- no directions- if anyone has them please email them to me at susanmcvicker@gmail.com. It is the 10x10 pergola. Thanks for all your help!! Name: Nate | Comment: For those of you wanting to secure the pergola canopy 0015799, I used a grommet kit and put 4 grommets along the bar at each end then used bungee cords to secure to each side when not in use. This way I can still adjust when I want to use and remove at the end of year for storage. Name: Brandie | Comment: Bought the pergola in the upper right...it's missing half of the pieces of B,C,D, and E...customer service has been no help at all. Would anyone like to sell those pieces to me? Name: Nancy | Comment: I purchased my 10 X 10 Delux Gazebo from Lowes a few years ago (pic top left) and contacted Garden Treasures to get a replacement roof and screens after about 3 years. The replacements were NOT cheap to buy but they sure were cheap in quality. Nothing like the heavy roof canvas and screens that came with the original structure. I replaced the roof and screens with the flimsey garbage they sent and after only six month there are holes appearing in both the screens and roof. NOT worth the money to replace the original roof and screens wear out. Name: Comment: Replacement canopy is available at gardenwinds.com. Name: Jane URL: jtriphahn@sbcglobal.net Comment: I have the GardenTreasurers Living 10x12 gazebo that I bought from Lowe's in 2010. After flipping each season, I am now looking for replacement parts as the support bars are bent. I need an F,G, C, and E support bar. Basically a set of the long and a set of the short bars. If anyone is getting rid of theirs and has these parts, please let me know. Name: Jane Comment: Also, I have an extra replacement canopy if anyone needs one. 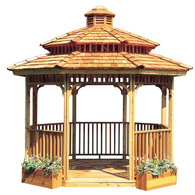 Name: Don URL: http://www.gardenwinds.com/advanced_search_result.php?keywords=cnyy-lwslcm540&search_in_description=1&search=Search Comment: Top Left Gazeebo is from Lowe's. Garden Treasures, 10 x 10, deluxe Pagoda House. My experience is that you will be replacing the conope every 12-18 months. Name: kyle URL: http://pdf.lowes.com/useandcareguides/749241412035_use.pdf Comment: found these instructions online for the 10x10 pergola that I have. i am missing the roof connector if anyone has one that they aren' t using!! or knows where to buy one! sorry the link above didn't work.